The 23rd of October 2017 is a big day for movements of resistance and resilience! 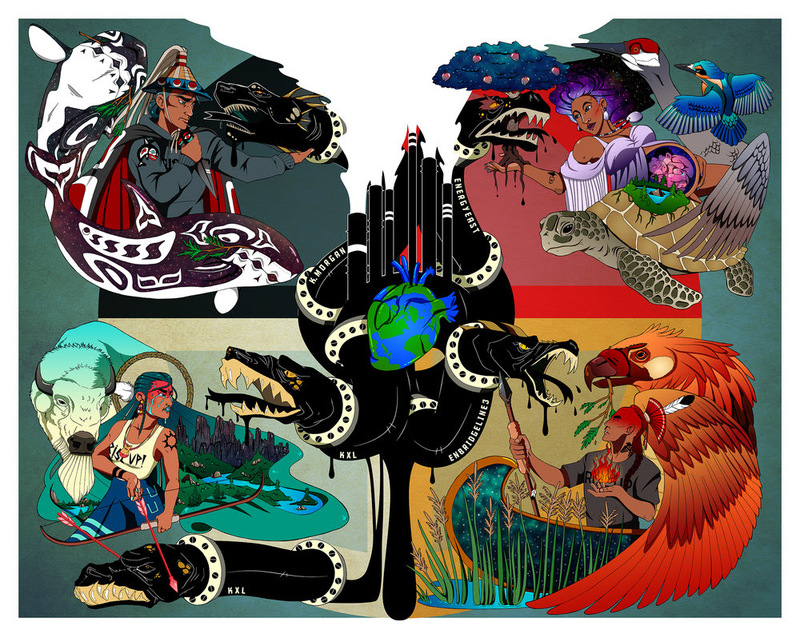 Today the indigenous-led coalition Mazaska Talks kicks off their “Divest the Globe” campaign, with world-wide mass actions against the banks that fund pipeline developments and tar sands extraction. These 3 days of action are so important, not only because indigenous communities are standing up for themselves and all the inhabitants of the earth with bigger and bolder actions to protect land and water, but also because divestment really works. Gone are the days when rallies and marches and clever visuals at symbolic civil disobedience actions could effect change. If those days ever existed… as we near the 50-year anniversary of May ’68 and so many other landmarks of the hippy counter-culture, it is important to recall that insurgency among the troops did more to convince the government to end the Vietnam War than flower-power protest movements, which the most privileged and self-congratulatory baby-boomers will surely replay ad nauseam during the next few years. And it is shameful that we minimize the thwarted Black Power revolution as mere “Civil Rights Movement” at a time when conditions for poor people of color are worsening and white supremacy is on the rise – what was accomplished during the 60’s that we can celebrate today? Yeah, sure, the 60’s were cool, an illuminating spark of a historic moment, and they deserve to be remembered with pride. But most of the positive changes that began during that period have been rolled back during my lifetime; and rather than unquestioningly celebrating an aging generation’s coolness, we all need to recognize the dire situation presented to our youngest generation. Today’s world feels like the 60’s in reverse, with a century’s gains in human rights and democracy eroding as rapidly as a hurricane-pounded coastline. 2017 is the 40-year anniversary of the punk counter-culture’s cry, “No Future.” Today the millenial generation, so often unfairly maligned by their self-righteous elders, actually are faced with the existentially crippling prospect of no future. But many are rising with a fierceness, eager to face the challenges presented. Every day I am impressed by those who bravely refuse to accept the system that they have inherited. And this newest generation of resisters do not just march around! Shouting “NO!” in the street is never enough – the 1% have no need to listen to us. Instead, we must act strategically to force them to listen. The only thing they care about is their profits, and with massive coordinated disruptions, we can block their sources of income and create mounting costs, compelling them to change their destructive behaviors. This is why divestment campaigns have been effective at slowing dirty development and at escalating public awareness and engagement too. Now is a time of crisis – a time of great danger but also a time of opportunity, of possibility. It is the right time to try to grow our movements as big and as fast as we can, and divestment campaigns are an excellent first step for many. I urge you to join a Divest the Globe action nearby, or at least to divest yourself from the offending financiers. Especially if you are new to this kind of thing, this is the perfect place to start. Our new movements are gaining momentum, and fighting for deep and lasting change. In 50 years I hope that we can look back on this historic moment with pride. Also, we must say “YES!” to visions that inspire us to build a new world together. On this day I am kicking off a crowd-funding campaign to get our Mutual Aid Disaster Relief Training Tour on the road. After you have checked out Mazaska Talks, help our team to do the essential base-building work that will connect grassroots direct action networks and increase skills for community resilience, collaborative power, and inspirational vision in diverse communities all over the US and beyond. Because in today’s world, disaster response is not only about hurricanes and earthquakes – our compassionate emergency hearts need to respond to the all-too-frequent unnatural disasters like hate rallies, for-profit prisons and criminalization of the poor, endless genocidal wars, mine waste spills and pipeline developments. Neoliberal Capitalism is a daily disaster. The history of Colonization has been a 500-year disaster. Enough already! It is time for a new model. We are proving the power of mutual aid and inspiring hope and resiliency through our actions; we are going beyond words and symbols and demonstrations to proactively construct collective power from the bottom up, the kind of power that is ready to respond to community needs when the government does not show up. We are building bridges between the most vulnerable and disempowered communities, working as hard and as smart as we can to facilitate countless nodes of people power, infinite overlapping communities of resistance and resilience, and strategy that maximizes the effectiveness of all of our collective actions. Because we are learning from our elders, but caring for our descendants. Looking forward, always. Our Training Tour is just the beginning. We intend to spark a new kind of movement – a Movement for Mutual Aid. Please help us get our show on the road! And please check out the fund-raising campaign, and please share widely! Thanks!